At Galaxy Mobile Storage we offer customer orientated storage solutions. Our storage options, are designed to fit each and everyone of our customers. Forget overpriced Self-Storage! Mobile Storage means secure, portable storage units delivered to your home, business, or office. 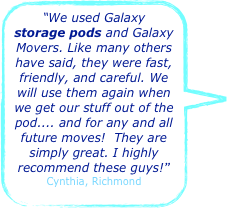 Load the storage pod yourself,or you can have professional Galaxy Vancouver Movers do it all for you. Our revolutionary engineered container are designed to fit Vancouver Storage Customers, made from British Columbia wood, the pods breath unlike other Vancouver Storage Companies metal containers, whose containers cause your belongings to mold. 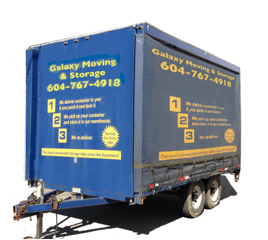 Galaxy full-time Movers, professionally load and blanket wrap your items for storage in the portable storage containers, or pods, making our service like no other Vancouver Storage Company. Ultimate Efficiency: Having Professionals load your containers, means the storage space usage is maximized and your goods are properly wrapped for storage. Galaxy Vancouver Storage will deliver your unit for YOU to Load. If you desire the added security of loading your unit yourself, the U-LOAD is the perfect Vancouver Storage Option for you. We deliver our portable Storage Unit to your door, You then load it, and lock it. Convenience: Packing your Galaxy Storage Container yourself, you place belongings strategically according to your needs. Selecting a Storage Option for you. 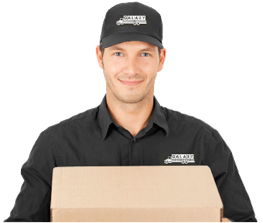 We deliver the storage unit to your home or office for efficient and easy loading, within feet from your front door! Your personal belongings are loaded in your Galaxy Storage container. Choose between movers or U-LOAD. We bring the containers back to our Employee-only climate controlled, sprinklered, alarmed indoor warehouse. Storage is that Easy, when you entrust the Professionals at Galaxy Moving & Mobile Storage to store and handle your goods. Call us Today, to book your storage pod, or to talk to a knowledgeable Galaxy Storage Team Member.